Welcome to the 1-800-ASPHALT website, home of the Brown Construction and Paving Corporation. We are a Cincinnati asphalt paving contractor, located in Southwestern Ohio. We serve the greater Cincinnati and Dayton, Ohio areas with driveway blacktop paving services. From parking lots to driveways, we service all of your asphalt paving needs. We offer a wide variety of services, including commercial & residential asphalt paving, blacktop sealing, asphalt patching, pavement milling, asphalt infrared repair, and line striping. While you are visiting our website, please feel free to visit our asphalt paving reference page. We work very hard at providing quality blacktop services for our customers. This is why we encourage you to view our extensive reference library. Whether you are considering a new asphalt driveway or resurfacing your deteriorated blacktop parking lot, our asphalt reference library will show you that we are capable of handling all paving jobs. We have several video references that are available for you to physically see our asphalt paving crews in action. We want our potential customers to have the opportunity to see our company in action on actual job sites here in the Cincinnati and Dayton areas. These videos are in YoutTube format and allow you the chance to see our asphalt equipment and blacktop procedures. You will be able to see why 1-800-ASPHALT has an A+ rating with the Better Business Bureau. It is because we care about our customers and their projects. It is our opinion that a truly informed customer will ultimately be a satified blacktop customer. If you would like an estimate on an asphalt paving project, please call our office directly at (513) 899-4496. Or, if you live in the (937), (513), or (859) area code, simply dial 1-800-ASPHALT. 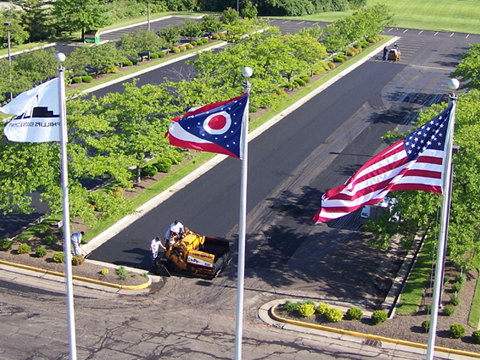 If you would like to get a quote on an asphalt project, you can e-mail us at sarah@1800asphalt-ohio.com Please type "asphalt quote" in the subject bar. Thanks for visiting 1-800-ASPHALT, Brown Construction and Paving Corporation. Save some money on your next asphalt project! Click here for online coupons. Want to see videos of our work? Click here to see actual video of our jobs. Want an estimate on your asphalt project? Click here to email an estimator.